Ideally, community management contributes to coherence between strategy, corporate culture, desired reputation and perception from outside – this is why an overall vision and approach should go beyond a single department or hierarchical level (“silo”). And although I am aware that this opinion is widely discussed, I advocate for a clear distinction between social management and community management since the later means implication on a strategic level. What professional position do you have? Is your official job title “community manager”? One of my current assignments is a part-time mission as German-speaking community manager for a Swiss clean tech start-up. De facto, I am part of the team, which I find is essential: in order to be efficient and authentic, I need to know the “mood” of the company, the business environment, and the nature of my work makes me be in touch with all team members on a regular basis. Before being a community manager, what position were you in, and what is your education? I have an academic background in sociology, information management/IT and economics. My current assignment as community manager is part of my activity for Sociostrategy, my company, with which I have been doing mainly consulting and training. This was an opportunity to broaden my knowledge, conciliate theory and practice, and gain valuable experience in the start-up field. Did you become community manager by default or out of interest? Community management is the combination par excellence of the areas I am passionate about: sociology, technology, and their intersections. This is why I have been part of the Swiss Community Managers Association (SCMA) from the very first, yet informal meeting in June 2010. As a sociologist, I am interested in social dynamics, communities and interactions of every kind – be they online or offline. Which qualities and qualifications are important when doing managing communities? There are three main points, and although they might be weighted differently for certain positions, they are rather universal. First, there is of course the knowledge related to the brand/product. Then, there is the know-how of technology and communication, e.g. platform-specific functions, how to interact online etc. Last but not least, it is crucial to have an analytic yet practical mind which allows for connecting the big picture with very detailed action. Are you mandated strictly for community management only, or more generally for advice in digital matters? In my opinion, it is impossible to be mandated strictly and only for community management since community management can relate to marketing as well as to PR, customer service, support or R&D, and collaborating internally is essential. In practice, a community manager might be bound to do social media management, but it would be a shame to restrict him/her role to the later only. This would limit a great deal of the potential inherent in the way social networks work. What difficulties have you met most often as a community manager? Working with a young start-up in a dynamic environment, I am lucky that what is the most challenging part of my work is also the most interesting one: there is so much to be done… it must be realised fast. Personally, I am used to slower, more thorough cycles of implementation, and the perfectionist side of me is sometimes disappointed that there are not enough resources to realise everything theoretically possible. But on the other hand, great discretionary power allows me to make necessary choices and set logical priorities. Which tools are nice to know? Related to the point “know-how of technology and communication” mentioned earlier, I would underline two kinds of tools I think are indispensable: tools providing metrics, because indirect feedback is invaluable, and tools allowing appropriate monitoring. A basic understanding of algorithms and some knowledge of HTML / PHP is always welcome, and if the position includes content publication, being able to edit images and videos will come in handy. And, of course, it would be possible to name certain social networks such as LinkedIn, Facebook, YouTube etc. However, for the need of most companies, being curious and having a certain flair for technology will go a long way already. This might already be enough to know at what point hire an outside expert, e.g. for an e-mail marketing campaign. In community management, instead of privileging proficiency in a single platform, it is preferable to have generalist knowledge and be a fast learner. The digital landscape, especially the importance and functions of third-party platforms, is bound to change rapidly… but the digital paradigm itself is not. What is the future of community management? Nobody has a crystal ball, this is why unilateral predictions should be handled with care. Community management, in between digital strategy and social media management, must outline against theoretical generalisation as much as against unilateral specialisation. Defending such a polyvalent, transversal function is a challenge and time will tell if and how this intermediate position can be established. But in my opinion, community management is important because it contributes to true social business by connecting strategy with experience. PS: It is true that neither interpersonal skills nor service attitude or something in the same line were mentioned at any point. I did not think of this since it seems obvious to me… (In about the same way that I have difficulties imagining a pediatrician not liking children since he/she will be dealing with children all day [NB: it is about the amount of time spent – no other analogy intended!].) But, of course, I gladly state it clearly that, as a community manager, a basic requirement is to generally love communicating and be good at interacting with people. 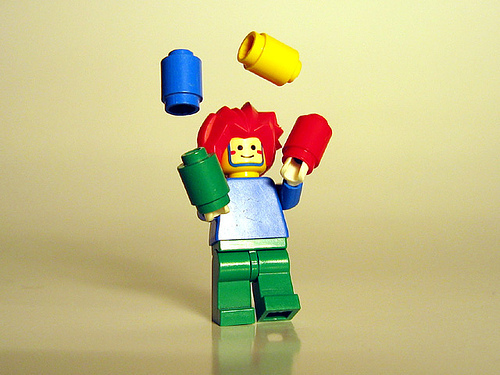 Top picture by Jim Pennuci; “Juggler” picture by Helico. 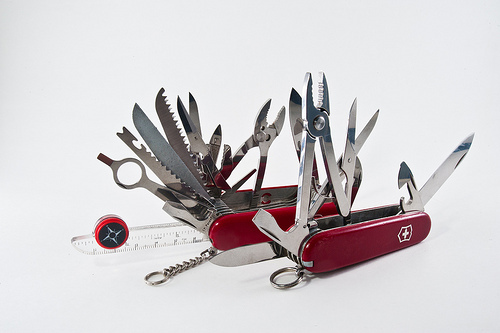 Please note that the Swiss army knife, illustrating perfectly the required polyvalence of a community manager, is a metaphor heavily inspired by fellow community manager and friend David Labouré – credit where credit is due!